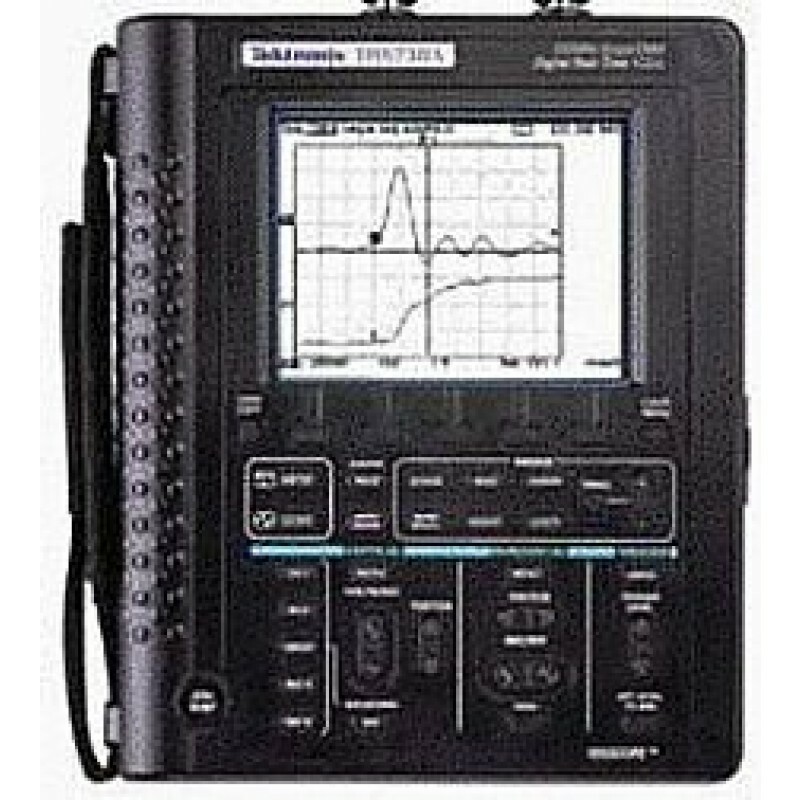 The Tektronix THS730A oscilloscope is a graph-displaying device – it draws a graph of an electrical signal. In most applications, the graph shows how signals change over time: the vertical (Y) axis represents voltage and the horizontal (X) axis represents time. The intensity or brightness of the display is sometimes called the Z axis. The Tektronix THS730A oscilloscope’s simple graph can tell you many things about a signal, such as: the time and voltage values of a signal, the frequency of an oscillating signal, the “moving parts” of a circuit represented by the signal, the frequency with which a particular portion of the signal is occurring relative to, other portions, whether or not a malfunctioning component is distorting the signal, how much of a signal is direct current (DC) or alternating current (AC) and how much of the signal is noise and whether the noise is changing with time. Sensitivity: 5 mV to 50 V/div (to 500 V/div with 10X probe). Roll Mode: = 0.5 s/div. Trigger Types: Edge, Pulse, Video, External. Video Trigger Formats and Field Rates: Odd field, even field and line. External Trigger Input: 5 MHz TTL compatible. Waveform Processing: Add, Subtract, Multiply, Calculate Watts = V x I. Acquisition Modes: Sample, Envelope, Average, Peak Detect. Cursor Measurements: delta Volts, ? Time, 1/? Time (Hz), Degree (phase). Cursor Types: Horizontal Bars, Vertical Bars, Paired (volts @ time). Display System: Interpolation: Sin(x)/x. Format: YT and XY. Mode: Vector, Dot, Vector Accumulate, Dot Accumulate. DC Voltage Ranges: 400.0 mV to 880 V.
DC Volts Accuracy: ±(0.5% of reading + 5 counts). True RMS AC Voltage Ranges: 400.0 mV to 640 V.
Maximum Float Voltage: 600 VRMS CAT II, each channel (probe dependent). Resolution: 4000 count, 3-3/4 digits. AC Volts Accuracy: ±(2% of reading + 5 counts). Resistance Ranges: 400.0 O to 40.00 MO. Resistance Accuracy: ±(0.5% of reading + 2 counts); 40 MO: ±(2% of reading + 5 counts). Diode Test Range: 0 to 2 V.
Continuity Check: Audible tone when < 50 O.
Modes: Min, Max, ?, Max-Min, Avg, Hold. Nonvolatile Storage: 10 DMM screenshots. Vertical Zoom Capability: 2X, 5X, 10X. dB Scale: Selectable, referenced from 1 mV to 10 V.
dBm Scale: Selectable, referenced from 50 O to 600 O. Safety: UL3111-1, CSA1010.1, EN61010-1, IEC61010.1. Power: NiCd rechargeable battery pack with AC adapter (both included). Battery Life: Approx. 2 hours from full charge. Display Resolution: 320 x 240.